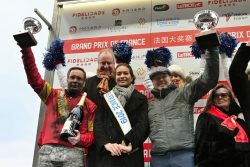 Vincennes, FR — The prestigious Grand Prix de France at Vincennes Sunday afternoon was an easy task for Sweden´s Readly Express driven by Björn Goop. Readly Express was in command from start and was never challenged. The connections of Readly Express celebrate following a win in the Prix de France. JLL Photograph Le Trot Photo. The 6-year old trotter, who Friday night was named Horse of the Year in his home country, won in 1.53.1 (mile rate) followed by Swiss-owned and trained Uza Josselyn driven by Gabriele Gelormini and Bold Eagle driven by Franck Nivard. Readly Express was a stand out in the race, where Prix d’Amerique-winner Belina Josselyn driven by Jean Michel Bazire went off stride just 150 yards after the gate left the trotters, and where Bold Eagle once again showed, that he might have had better days. Readly Express got 157.500 Euro for the win.